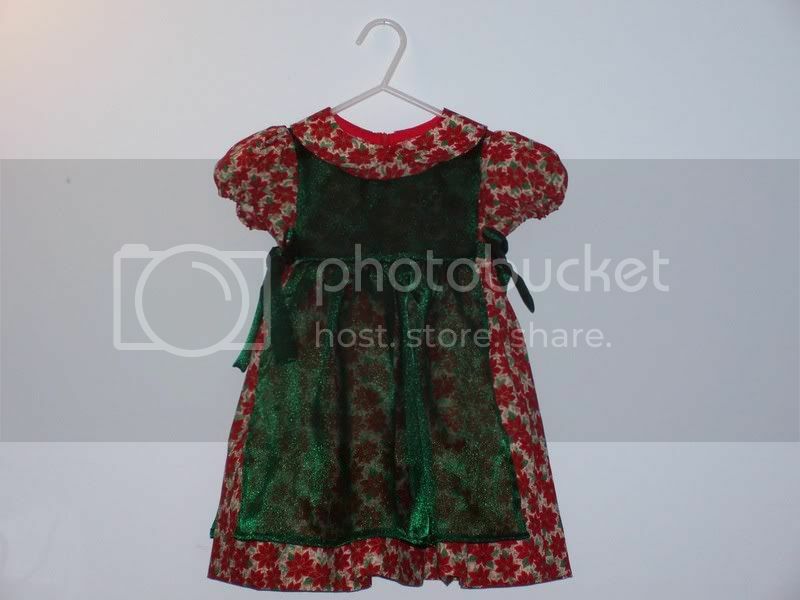 I made this Christmas dress for my granddaughter. I used Butterick 4054 in a size 1. The poinsettia fabric I've had for several months (it wandered from my mother's stash to mine). The green sheer pinafore was my youngest daughter's idea, I was a little hesitant at first but I really like the end results. very nice! I hope I can get some made for next year! Very pretty. What a lucky little girl she is. That is adorable. Again, I wish that I had a little girl to sew for. You guys will just have to help me come up with some cute ideas for little boys. Lovely dress and the pinafore is so cute. It really makes the dress. Beautiful and so holiday-ish. Lovely. Very sweet. I miss sewing cute little dresses. I'll probably end up with 4 or 5 grandsons. very sweet-I like the pinafore...it would look cute with a white eyelet lace pinafore too. I made my dd a dress one time when she was about a year old and used old lace curtains as a pinafore-was really cute.